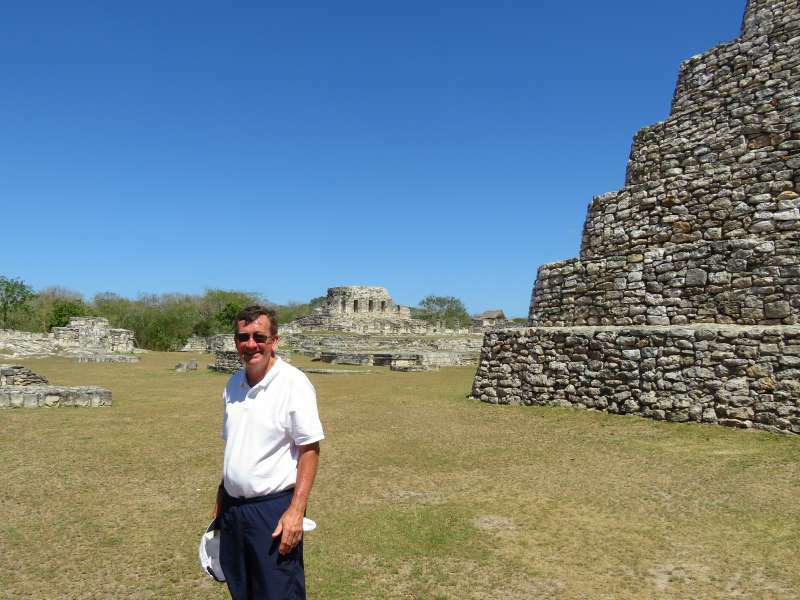 The Travelling Lindfields: Mayapan Archaeological Zone: Chichen Itza without the crowds! Mayapan Archaeological Zone: Chichen Itza without the crowds! Mayapan Archaeological Zone in the Yucatan Peninsula, Mexico has everything which Chichen Itza has - except on a smaller scale and without the bus tours and crowds. If you like Chichen Itza but wish you could wander through the ruins quietly with the place to yourself then you will love Mayapan. Mayapan was the last great Mayan capital before the arrival of the Spanish conquerors. Founded in AD 1000 it dominated northern Yucatan politically and culturally until the mid-15th Century. One of the only Mayan capitals to be surrounded by walls, Mayapan had 12,000 inhabitants within a city centre of 6.5 square kilometres (4 square miles) and a further 5,000 outside the walls. Mayapan's rulers were particularly war-like. The city's history (to the extent to which it is known) is one of upheaval, conquest and, finally, defeat. The story of the dominance of Mayapan's ruling family in the northern Yucatan begins with Hunak Ke'el a prince from the nearby village of Techaquillo. According to the story, Hunak Ke'el was captured and thrown into a 'cenote' (a natural well or sinkhole) at Chichen Itza as a human sacrifice. He survived, sadly the story doesn't say how, and declared war on Chichen Itza. Chichen Itza was defeated, its power destroyed and the city abandoned. 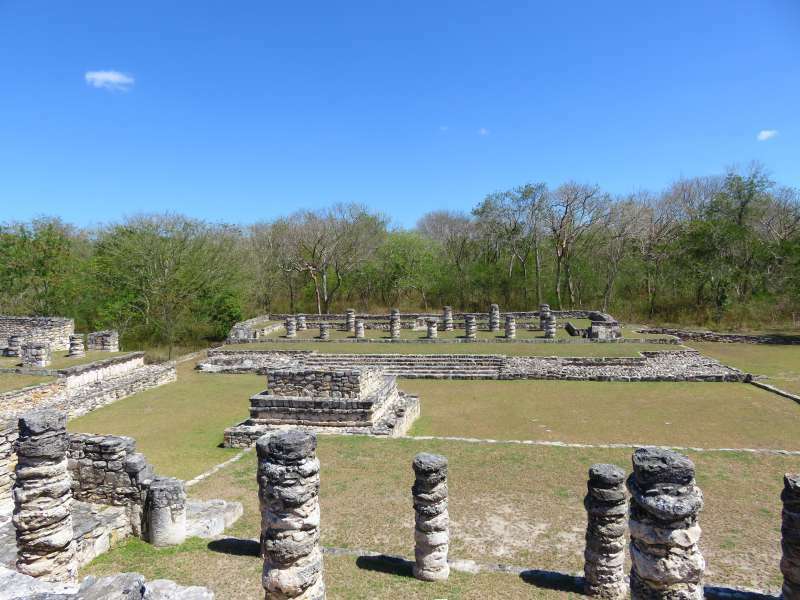 Hunak Ke'el's family, the Cocom dynasty, dominated the northern Yucatan until the mid-15th Century with Mayapan as their capital, until almost the entire family was slaughtered in an uprising and Mayapan was in turn destroyed and abandoned. What struck us most about Mayapan was its resemblance to Chichen Itza. Like Chichen Itza there is a a large pyramid the 'Temple of Kukulkan', a circular observatory much like the Caracol at Chichen Itza, cenotes, temples and wall carvings. 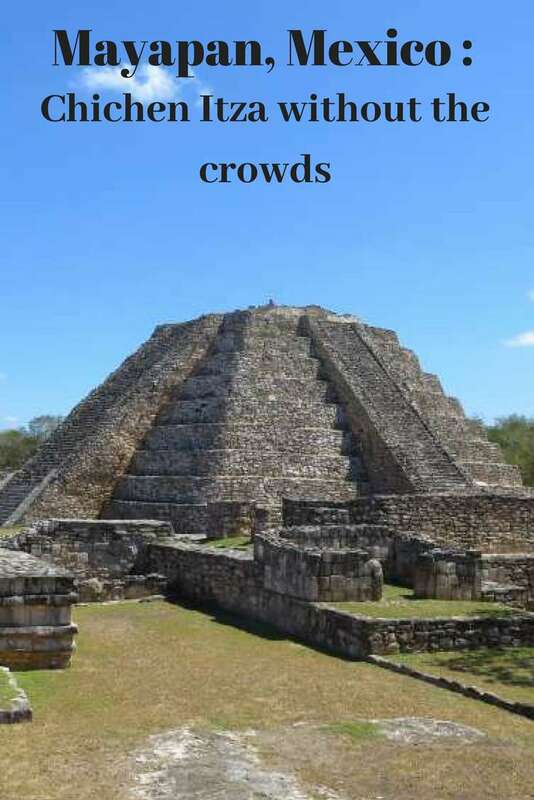 Although the pyramid at 15m (50 feet) high is much smaller than the pyramid at Chichen Itza and the observatory may not have been an astronomical observatory at all, the complete lack of crowds and tour buses more than makes up for Mayapan's smaller dimensions. This is a site where you can wander almost entirely on your own, you can even climb the pyramid if the heat doesn't defeat you. Can you see the resemblance to El Caracol at Chichen Itza? David looking cooler than we felt at Mayapan. Mayapan is 48 kms (30 miles) south of Merida on a good road (Highway 184). The best way to get there is by car, although I understand there is a local bus from Merida. If you decide to take a taxi it might be wise to have the driver wait or return to pick you up because there is nothing there other than the ruins and a ticket office. 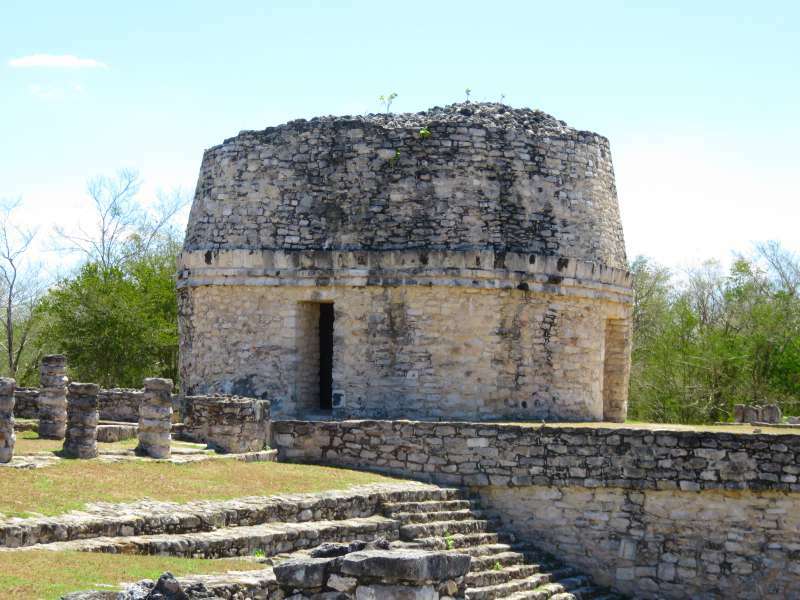 Mayapan is also the name of a small town which is a further 48 kms south east of the archaeological zone. 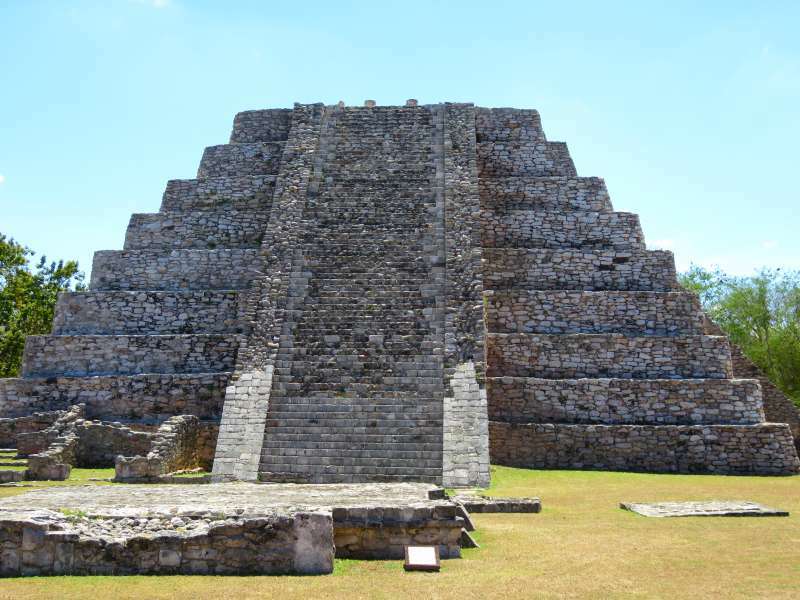 Instead you need to head toward the 'Archaeological Zone of Mayapan' or 'Zona Arqueológica de Mayapan'. The nearest town to the ruins is Telchaquillo. Take cash for the entrance fee. The fee is quite small but we found that not all the ruins we visited in the Yucatan Peninsula had facilities to handle payment by credit card. Wear a hat, carry water and apply sunscreen. There is almost no shade. Take lunch with you. Apart from toilets, a car park and the ticket office, there are no facilities. On the up side, there are no crowds of other tourists or souvenir sellers either. The whole site is 4 square kilometres (2.5 square miles) and takes between one and two hours to explore. 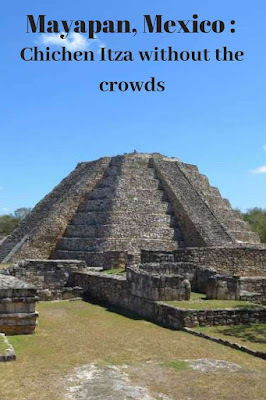 Chichen Itza: Everything you need to know before you visit. The flamingos of Celestun, Mexico: Everything you need to know before you go. Mayapan Archaeological Zone: Chichen Itza without the crowds. Watch out for topes! And other life saving tips for driving in Mexico. If you have any questions either leave a comment or contact me by email or through social media. I am happy to help out fellow travellers. Oh these look amazing. Visiting the Maya temples has been on my list for years and years. I love that there are still temples that are relatively unknown. There are many which are so quiet you can just wander around by yourself and yet if you have a car they are not hard to get to. One I've not heard of - good to know since it's relatively unknown and has fewer crowds. And David does look very cool which I know is not too easy - when I was in Tulum, which has the coastal breeze, we were suffering form the humidity. I loved Tulum. It was a lot more crowded than Mayapan but like Chichen Itza Tulum is so big I didn't find it a huge issue. 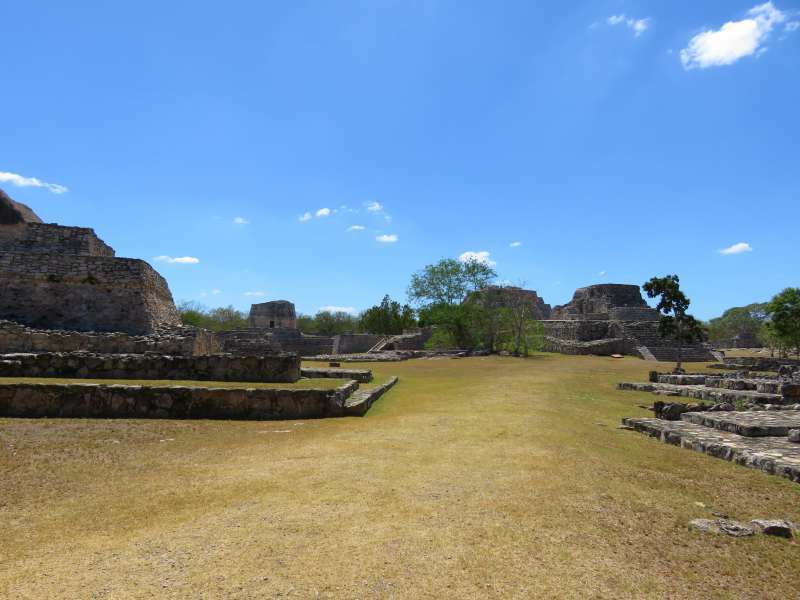 Thanks fro sharing this insiders view of the Mayapan archaeological zone. We never realized it existed, but looks like it would offer a more personalized visit. Especially if we weren't fighting the crowds like other sites. If you are ever in Mexico's Yucatan Peninsula, I can highly recommend a visit. Oh yeah, a lot of resemblance to Chicken Itza. But I am ok with the crowds so I will brave it and hustle my way around. Will go in October next year and also visit the flamingoes. Hopefully it will be cooler. Don't get me wrong. I still loved Chichen Itza. The trick is to try to get there early so you beat the tour bus crowds, or do what we did and stay overnight. I loved exploring Mayan ruins in the Yucatan, but even several years ago, it was a challenge to see the beautiful carvings for all the tourists! Mayapan looks wonderfully unspoiled, and well worth a visit! 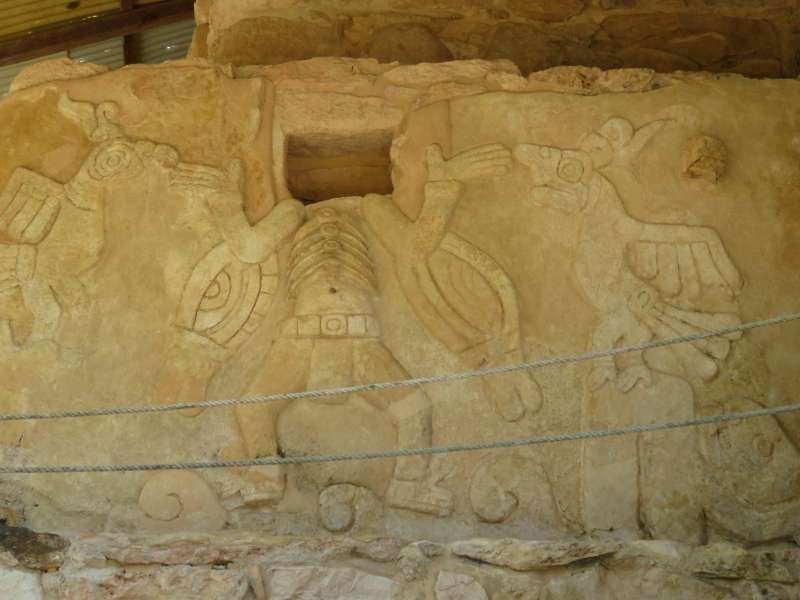 At Mayapan we could stand in front of the carvings and be the only ones looking at them. It was fantastic. So many temples, so little time. I haven't heard of Mayapan before. Someday. Just do what we did. Head to Yucatan and hire a car. You can see all the Mayan temples in a couple of weeks - done -lol! There are many Mayan ruins throughout Mexico and Central America. Thanks for finding a fine example (without the crowds). I found a similar ruins in Belize on my way to Tikal years ago. The stairs at these temples are always so steep. I didn't climb many of them. It was very hot and I didn't want to put any more strain on my heart than necessary. Someone told us that the reason the stairs are steep in so many temples is that when people climb them their heads and upper bodies are bent forward as a sign of respect to the gods. I think we learned that at the Angkor Temples in Cambodia but it may also have applied in Mexico. I enjoyed your post on Mayapan very much. Had no idea of its existence. I've been to Chichen Itza, so I can appreciate Mayapan as a great alternative. If you ever go back to Mexico you should seek out Mayapan. 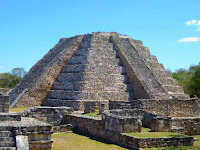 If you like Chichen Itza you will love Mayapan. Chichen Itza gets all the publicity, followed by Tulum but there are so many wonderful temples in the Yucatan Peninsula. Haha - I love your 'more people than usual - about five', comment. I will be publishing more posts on Mexico in the coming weeks/months so keep an eye out for them. I can also recommend Coba and Uxmal. The pyramid at Uxmal is huge, like Chichen Itza. Coba is set in the jungle and has an otherworldly mysterious feel. I am so fascinated with Mexico and the Mayan culture in particular! Really spectacular! Absolutely love that this place looks so empty! Heard so many stories about bus loads of tourists at Chichen Itza! We still enjoyed Chichen Itza. I would definitely go there too. Just try to arrived before about 10 a.m. I hope you manage to get there. It is fascinating.